Congratulations! Your club finished 19 in the CC EVENT #31 that ended on 23 Sep.
Post as many rounds by September 23, 2016 10:00 pm Pacific Standard Time using a Club Pass or Super Pass to earn points for your WGT country club and win the clash and prizes. Good luck! Calvin and Hobbes - points. We here at VOTSCC enjoyed our CLASH with your CC in CLASH # 31. We thank you and wish you the best of luck . pdb1 wrote: We here at VOTSCC enjoyed our CLASH with your CC in CLASH # 31. We thank you and wish you the best of luck . Thanks for the nice note. Good game in the clash maybe we can go again the next one. All the best from the No Drama cc. Come one(1) Come all to help our VOTSCC generate points. The more points WE generate, the more PERKS we receive as a club. Its the first game on the back nine((9) of Kiawah Island. Best of shots to ev1.. 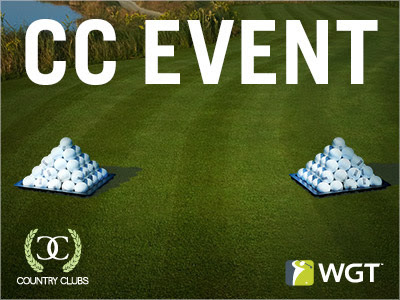 Play in this two-day CC Event to contribute to your club's XP, competing for top leaderboard spots and in-game rewards including these golf ball pyramid tee markers and flags. And now, the top three clubs will win in-game prizes! Good morning . CLASH # 31 is on . This is not a required event . Many of us do play . And enjoy this event . Any player who plays receives a bonus 5 pack of free passes " PASSES FOR CLASHES " . From myself . Bonuses from Cory as well . This is a very fast pace event . If you enter ? And if possible . Please try and divide your time playing throughout the 48 hour event. The later rounds may be critical . Please keep that in mind . And save something for a possible crunch time at the end between 4:00 PM and 10:00 PM PST Friday evening . . Most of all . Please enjoy . If you have any questions . Please just ask Director Cory or Director Jtcooki , or Director Kookster . While I am at work . Have a GR8 day E1 . Ocean Waves - 243 points. Cobra Inn 1128 -794 points. leduc country club - 765 points. Looks like we are off to a good start early this morning. Look at Kelly leading the way with Mario on her heels in the first matchup!!! I have sent 5 free passes to everyone that has joined so far & will continue to do so as others jump in. After this CLASH with No Drama CC . There will be 1 more 4 hour CLASH . The final one . Having fun Jeff ? Looks like it . Along with 23 other fanatical SunSpots . Looks like the " golf ball pyramid tee markers and flags " are in the bag . Well done everyone . we are 10 - 0 . Likely will finish 11 - 0 . Again . No big deal . But it is AWESOME . This is the final CLASH with Calvin and Hobbes . I know you are Jeff . Thanks for all you do . Thanks Corey, you were clutch yourself. I appreciate your messages letting me know we are in a clash and you gift passes. I'm just happy I can contribute, it's much easier via my iPad especially of I'm traveling! I am sorry I didn't get to finish our bracket finals. I traveled to Chicago for a Big 10 conference meeting and couldn't set it up from my iPad. Congrats on winning that bracket event!